Fed up with lame flavors and want to get a taste of something else? Let us introduce you to the best hookah flavors. We are avid hookah smokers and have been in the hookah business for quite some time, therefore we have the experience and knowledge for what kind of shisha flavors you are looking for. I used to always be fed up with trying a boat load of new hookah flavors and they didn’t taste how I thought they would taste or what the flavor stated it would taste like. These flavors are one of the best hookah tobacco you can buy! We would like to recommend you a few flavors that we love to smoke day in and day out! These flavors we can assure you are the best quality and best hookah brand. If you are hesitant about smoking hookah we have a section answering the question is shisha bad for you? That is indeed a good question since most Hookah smokers are not really aware of Hookah’s true origin, relevance to shisha, overall potential as well as many other facts. So, let us guide you through this one-of-a-kind and aroma-rich journey in the world of Hookah smoking. Hookah is a specially designed tool that enables you to smoke or vapor flavored tobacco. This smoking tool consists of several components, the most important of which are the following. The first and one of the most fundamental Hookah components is the container. This is the place where you store the water. This container is usually made of glass so that Hookah smokers can see the smoke’s journey through the water as they inhale. 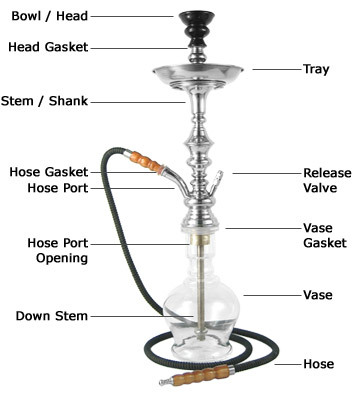 Another significant part of the Hookah’s body is the flexible tube known as the hose. This component is useful for transferring the smoke as well as cooling it before Hookah smokers inhale. One last component which is essential for the Hookah’s proper function is the bowl. This is where you place the tobacco and the charcoal. Now that we’ve established what is smoking Hookah, we can readily clear the air when it comes to Shisha and its connection to Hookah. There is this idea that Hookah and Shisha are two completely different things. So, the Egyptian term Shisha – which means glass – comes to add up to Hookah’s function and is known to be the flavored tobacco used in Hookahs. However, this is not the case. Shisha is a synonym to Hookah and is a term that is popular in countries such as Egypt, Morocco, Algeria, Kuwait, Yemen, Sudan and many more. Unfortunately, people in the Western countries are ill-informed of this term’s practical and actual meaning. As a result, they tend to refer to Shisha (also spelled as Sheesha) as the flavored tobacco rather than the smoking tool itself. This misconception is a direct result of Hookah’s cheap commercialization in the Western world. 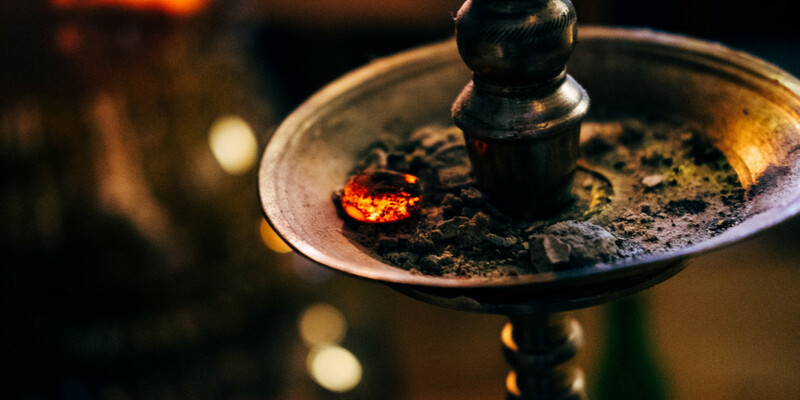 Hookah smoking is also associated with the fun of exploring several tobacco flavors such as apple, mint, peach, strawberry, orange, vanilla and many more. Of course, there are even bolder flavor choices such as licorice and Coke who favor the most adventurous of smokers. When I first started smoking I was always anti-mint. I never wanted to smoke mint ever, I simply preferred fruit flavors and that was it. The thought of eating mint after supper was how I treated mint flavors as opposed to smoking leisurely. Then my friends finally forced me, yes they literally forced me, to smoke mint. Okay maybe I wasn’t forced but when your a hookah addict and they only pack mint you are pretty much forced. To my surprise it was amazing, it didn’t burn like the other low quality flavors they had and it was fairly cheap. You can buy a whole kilogram for a really cheap price as opposed to buying 200 grams each. A whole kilogram, if smoked once a week, can literally last one year. Who wouldn’t want a year of smoking for around fifty dollars? Sounds like a steal to me. 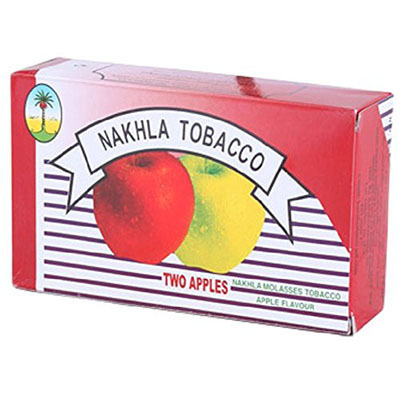 Nakhla Double Apple was created to meet the demand for the rising popularity in apple flavored shishas. Simply put Nakhla really nailed this their double apple concoction, and this is definitely one of the most pleasant apple flavors you will find in any shisha around the world. Although elusive, the Nakhla Double Apple is definitely something to keep an eye out for if and when it is available. This simply sweet and pleasurable flavor can really stand on its own, and perhaps more importantly, it can really supplement an already great flavor of another shisha type. Mixing this with an already fruity flavor like Al Waha CALI Twist can really strengthen the actual power and thickness of the resulting smoke. The Double Apple doesn’t really have a thin smoke, but it can definitely be made much thicker by mixing it with another flavor. Al Waha Elite Edition is a unique flavor that really stands out from other shishas for a number of reasons. The intriguing name incites the attention of consumers, and although it does allude to other reasons, the name of this flavor doesn’t really explain the great flavors that it features! This citrus and tropical pineapple blend boasts some of the thickest thunderclouds from any shisha product available, and that is absolutely a large part of the appeal. The tropical pineapple's off-notes are simply there to balance the citrus blend, and they do not overwhelm the overall flavor whatsoever. While cigarette smoking shows signs of a decrease in the recent years, tobacco consumption is ever-growing. This change can only mean one thing. The old-school Hookah use is gaining ground and, thus, Hookah smoking is readily the new tobacco trend in the recent years. But, who says that smoking Hookah should be boring? Unlike smoking a cigarette, Hookah smoking comes with a lot of perks. Not only is it a fun way to hang out with your friends, but Hookah smoking can turn up the heat regarding experimentation. You are probably wondering what this means. 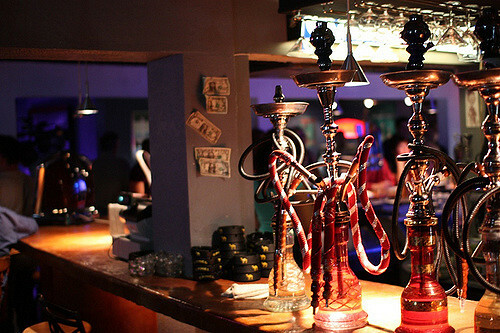 It means that the tobacco used in Hookahs is no ordinary tobacco. A lot of brands have come up with a broad selection of flavored Hookah. While most of them derive from classic and mainstream flavors such as apple or mint, there are some others which make a difference and steal the hearts of Hookah smokers worldwide. So, here are the seven most popular options for flavored Hookah tobacco today. Who doesn’t like the exotic taste of a juicy and sweet mango? Well, that is the reason why Hookah tobacco companies decided to give this flavor a shot. And they were right! This flavored Hookah comes with a sweet yet nip taste. The distinctive flavor and aroma of South American mangoes make this tobacco option ideal for those who seek a little extra sweetness. Another sweet fruit that made it into the list of most popular shisha flavors. What makes this flavor unique, though, is its sweet and sour essence. Add the smooth (and somewhat creamy) smell to the mix, and it’s no wonder Hookah smokers go nuts over this flavor. Smells peachy, right? Well, this flavor is bound to turn some heads. To be honest, most Hookah smokers try it out, out of curiosity, but the thing is most get hooked. 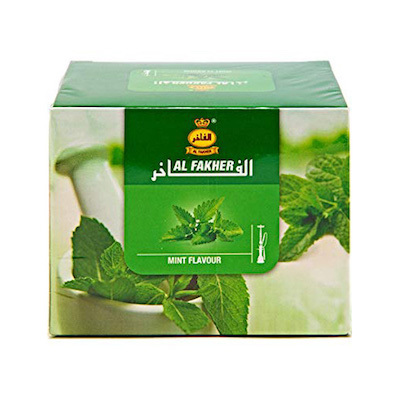 Its tangy taste and punchy aroma offer a pleasant Hookah smoking experience making people come back for more. Keep in mind, though that the particular flavored Hookah puffs out a lot of smoke. Vanilla is one of those flavors that can hit any list. So, here it is. Hookah smokers often describe the vanilla flavor as silky and creamy by Hookah smokers. However, what makes this Hookah flavor one-of-a-kind is the fact that it can stand on its own, but is also great when combined with other flavors such as orange or mint. So, we made it in the Top 3. Orange’s taste is a synonym to the description: strong zest. This flavor tastes exactly like oranges: tangy and juicy at the same time. However, keep in mind not to heat it up too much because you might get the exact opposite result given that this flavor is quite punchy. Mint is one of the most favored flavored Hookah. Most Hookah smokers don’t even think twice before they go for this flavor. But, what is it that makes this flavor so beloved? Some Hookah smokers claim that it is the freshness and the breezy taste that wins them over. At the same time, some others attribute this popularity to the mint’s numbing and soothing effect after that first sip. The mint flavor blends well with several other flavors such as apple. The ultimate crowd-pleaser, the king (or queen) of all Hookah flavors! Double Apple is the single most favorite flavored Hookah tobacco because it has a pleasant taste and a soft aroma. This exotic flavor blend of green and red apple can skyrocket your Hookah experience. The greatest thing about this flavor is it can taste both sweet and sour. And let’s not forget about the thick smoke. Despite that this flavor didn’t make it into the “Top List”, it deserves to mentioned. Hookah smokers worldwide choose Blueberry as their favorite due to its fresh and creamy taste as well as its rich puffs. No matter the flavor you like the most, these seven options are bound to please your palate. 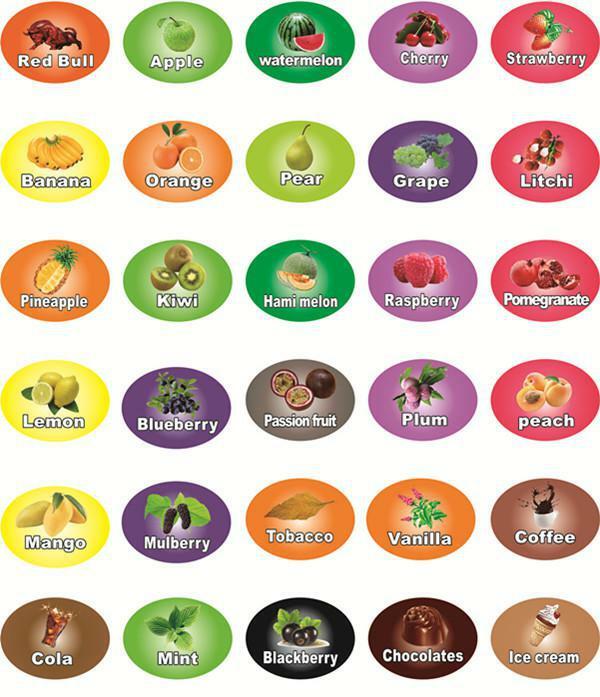 Feel free to drop a line if you think that some other Hookah flavors should hit this list. Until then, let’s Hookah things up! Hookah smoking has turned into a fast-growing trend nowadays. That means that more and more people turn to this social activity for numerous reasons. However, there is one reason that draws everybody’s attention: Herbal Shisha. According to this opinion, using herbal shisha is much healthier than smoking regular shisha. Is this the case? As the shisha market grew, so did the variety of related products. So, it was a matter of time before herbal shisha came to life. This shisha variation offers a nicotine-free alternative to those who want to enjoy a Hookah session without all the harmful effects of regular shisha. Luckily, herbal shisha still comes with a broad selection of flavors. Many claim that sugar cane fiber and tea leaves are the two main ingredients that shisha companies use to produce tobacco-free shisha. However, this is just a buzz around this type of shisha, and the recipe is kept secret. What is sure, though, is that they add glycerin to enhance the puffing effect. Is Herbal Shisha Healthier Than Regular Shisha? There is this rumor that smoking herbal shisha is far less risky than smoking tobacco shisha. But, this is a myth that is totally busted. Herbal shisha might not contain nicotine but still, contains tar as well as several other carcinogen substances. So, at the end of the day, it makes no difference if you smoke nicotine-free shisha or not. So, Why Use Herbal Shisha? It’s all a matter of personal choice. While some may argue that its taste is rather bland and indifferent, some others may claim that herbal shisha offers them a much better Hookah experience. This statement may depend on the shisha’s taste and smell. So, no one but yourself is to suggest whether you should use herbal shisha or not. My name’s Jason, but everyone calls me Big Jase. I’m a marijuana connoisseur. This certainly isn’t my first rodeo, so I decide I would start blogging about my experiences with weed. I’d also like get the comments section going so we can open up a conversation about things that matter.